This year we have done a little restructuring of our business and decided to run a few more cows and calves in Nevada and California. This idea looks great on paper and so far has worked out well for us, there is however one small drawback: branding. My family and I are currently residing in a fifth wheel trailer while we brand across Nevada and California for the next couple of weeks. When we brand these calves we also vaccinate and put in the electronic identification ear tags. Branding is a good opportunity to observe each calf and make sure they are healthy and thriving. A family of six in a fifth wheel trailer is a cozy situation any way you look at it. We have had a few minor glitches with the trailer: 1) unable to turn on the hot water heater (cold showers involve a lot of screaming kids), 2) the smoke detectors are highly sensitive (lunch wasn’t technically burned, just well done), 3) flushing the toilet is fascinating for my three year old (we may run out of water much sooner than anticipated). Fortunately, the fun of riding and roping is overshadowing those minor glitches. The kids have their favorite horses and are enjoying time in the saddle. 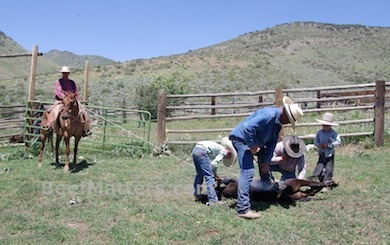 The older boys are equally happy to rope calves or work on the ground. 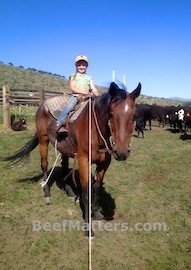 My daughter roped her first calf the other day. Well, okay, she didn’t actually rope it. Her Dad headed it, the cowboys put her pink rope on the calf’s heels, helped her dally and moved her horse into position. 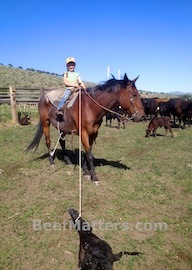 But, she is convinced she “roped” her first calf and she couldn’t be more proud. Have I mentioned lately how grateful I am for patient cowboys who take the time to help my kids in the branding pen? That leaves this little boy. After we gather the cows and calves and bring them into the branding pen, he spends the rest of the day supervising the branding crew. 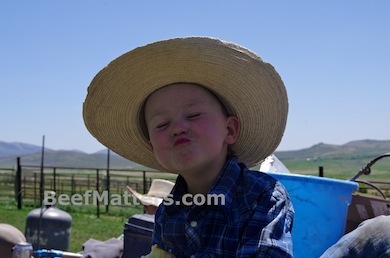 He sets up his office on the back of the flatbed pickup, which is the ideal place to play with a few toys, cheer on the ropers and practice his funny faces. 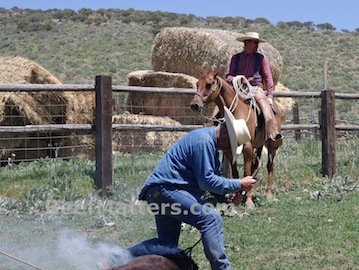 There is a lot of dirt, a few sunburns, a rope burn or two and we are also managing to get a few calves branded. All in all we are having a great time. Oh heavens! I call it roping if I can chase the steer to the end of the arena and hit any part of it with any part of my rope.